I do not pretend to be a film critic, but what I do know is that “Hidden Figures” is the movie the entirety of America needs to go see right now. 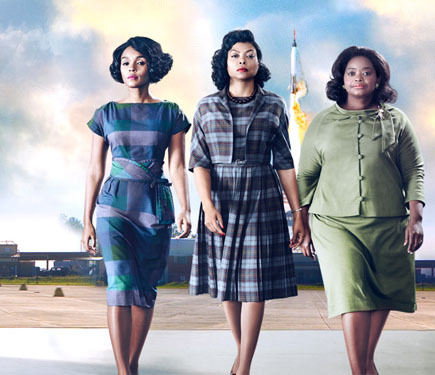 The story centers around Katherine Goble — married name Katherine Johnson — Mary Jackson, and Dorothy Vaughan, three Black, female mathematicians working for NASA during the Space Race. At the time, the Langley Research Center was racially segregated and a highly sexist workplace. The three women are initially employed as “human computers,” tasked with calculating launch and landing trajectories for all rockets sent up into the atmosphere. However, due to their exceptional minds and tireless ability to push past the seemingly interminable layers of discrimination, each woman worked her way to transcend the occupation of a calculator and used her brilliant analytical mind to become an integral, invaluable component of the organization’s success. In the film, we see the protagonists bombarded with horridly intentional discrimination from all sides. Dorothy is continuously disrespected by white, female counterparts in the East Computing Group. Katherine is forced to run for miles just to use the restroom because the one near her desk is reserved exclusively for whites, Mary must appeal to a judge in order to take classes at an all-white school to become an engineer, Dorothy is thrown out of her local public library by police officers because she was searching for a programming book in the white-only section. “Hidden Figures” brings to light the innumerable, explicit, and overt elements of discrimination women and minorities experienced working as mathematicians, programmers, and engineers. While we have come a long way from the days where Jim Crow reigned legally supreme and there existed no protocol for women attending Pentagon Briefings, remnants of that time still linger and can be seen quite clearly in the severe lack of women and minorities in the majority of professional STEM fields. One of the main implicit biases found against both women and minorities in STEM fields is the lack of role models and historical figures who look like them. My calculus classes continuously reference a series of white men — Euler, Pythagoras, Lagrange, L’hopital — who made various advancements in fields relating to integral calculus. I have never been in a math class where the teacher mentioned the name of a famous Black mathematician or one who was female. Though the discoveries of the men listed above may have been relevant to the lesson, only mentioning white, male names sends the message to the subconscious of females and people of color that we are lacking some instrumental intuition necessary for the acquisition of a great mathematical mind. In the same light, the fact that I and so many others had no idea Dorothy, Katherine, and Mary existed until watching a movie made decades after they changed the world is problematic and extremely unsettling. Simply shedding light on the existence of diverse mathematicians will help derail this implicit bias. In some ways, Swarthmore works hard to counteract biases such as these. Bulletin boards featuring women and minorities in various STEM fields grace nearly every department hall of the Science Center, and my Linear Algebra Professor Alexander Diaz-Lopez from last semester, continuously reminded the class that none of us should ever be afraid of pursuing our passions, even if those passions lie within in a field where we don’t see a lot of people who look like us. Recognizing the importance of “Hidden Figures,” Swarthmore has provided students with multiple opportunities to view the film, including a free, Friday night screening in Trotter and free tickets for our college’s chapter of the Society of Women Engineers. Additionally, this past Wednesday, the Women’s Resource Center held an event titled Majorly Underrepresented, which was a dinner and panel featuring students who are underrepresented in their respective fields. Yet, while the movie’s lessons are some that Swat has been trying to implement, it also exposes some faults within our own STEM programs. As much as Swarthmore does to counteract implicit biases in STEM fields, the school does reflect a percolation of some issues “Hidden Figures” illuminates. Take our own engineering professors: there is only one woman and one person of color in the entire department. The rest are white men. With regards to the impending Academy Awards, like I said before, I am neither a film critic nor a self-proclaimed cinematic expert. I do strongly believe, however, that this movie should win because it is an empowering story told through a beautiful piece of art. Whether the experts will concur with this assessment, I have no idea. With respect to box office results, Theodore Melfi’s masterpiece has achieved impressive numbers, earning $144.2 million so far. “Hidden Figures” has the grossed the most to date domestically out of any Oscar contender, surpassing even incoming favorite “La La Land” with. But after two years of #allWhiteOscars, nothing is a guarantee. Personally, I found the film to be extremely impressive on all fronts. Performers beautifully executed their characters, and the seamless progression of the story was well supplemented with entertaining background music. But most importantly, it unearths a story that has the power to influence children who love numbers, who are sitting in math class wondering why none of the famous mathematicians look anything like them. Yet the movie’s most noteworthy point is its ability to achieve a feat natural science teachers, professors, and organizations across the country have been failing at for so long. This intricately crafted piece provides those who are severely underrepresented in computational fields that people like them can and have historically achieved excellence. And if that isn’t greatness — cinematic or otherwise — I don’t know what is.